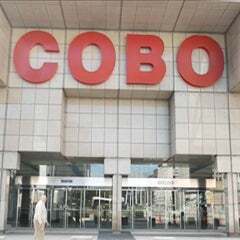 DETROIT August 16, 2013 -- Thom Connors, SMG regional vice president and general manager of Cobo Center announced today the September line up of gala events that will open Cobo Center’s new Grand Riverview Ballroom. 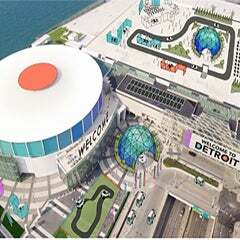 Two new events, the US Canada Border Expo on September 12-13, and MICHAuto, by the Detroit Regional Chamber of Commerce on September 24-25 join the September launch, along with four annual Detroit galas: Shimmer on the River, for the Detroit RiverFront Conservancy on 9/12; Goodfellows Breakfast, 9/20; Crain’s Detroit House Party & Crain’s SoundBiz Music Conference on 9/26; Detroit Cattle Barons Ball for the American Cancer Society on 9/28. This year, Crain’s Detroit House Party, a tradition to showcase “a Detroit that defies your expectations,” also includes Crain’s SoundBiz Music Conference, designed to “paint a bigger picture of music as it connects with the branding and in-car technology in Detroit.” The combined event invites people to explore the best that Detroit has to offer. The annual Shimmer on the River is the Detroit RiverFront Conservancy’s annual premier fundraising event that draws hundreds of people from throughout the metro area for an evening of food, networking, music and fun. Proceeds fund the continued development, maintenance, security and programming of the vital riverfront community. The American Cancer Society will host their 11th Detroit Cattle Baron’s Ball in the Grand Riverview Ballroom, where guests will saddle up for western-themed cuisine and to raise money to beat cancer. Raising more than three million dollars over the past 10 years, the ball includes a silent auction and pre-events. The 26th annual Goodfellows Tribute Breakfast honors Peter Karmanos, Jr. this year with the Edward H. McNamara Goodfellow of the Year Award. Proceeds go to the Old Newsboys’ Goodfellow Fund of Detroit to distribute 35,000 holiday gift boxes and 11,000 dolls to local area children during the holidays. Following in October, events scheduled into the Grand Riverview Ballroom include: Breakfast with the Detroit Fire Dept. 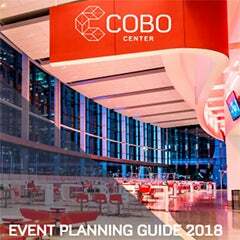 50th Anniversary 10/8; the Michigan Meeting Planners International Monthly Meeting and Luncheon 10/8; Awake and Empowered Expo 10/11-13; and the Henry Ford Health Systems Night of Stars Service Awards 10/14.